Niccolò discusses republics in the Discourses on the First Decade of Titus Livius. Translator: Ninian Hill Thomson. Project Gutenberg. We have in Italy, for example, the Duke of Ferrara, who could not have withstood the attacks of the Venetians in '84, nor those of Pope Julius in '10, unless he had been long established in his dominions. For the hereditary prince has less cause and less necessity to offend; hence it happens that he will be more loved; and unless extraordinary vices cause him to be hated, it is reasonable to expect that his subjects will be naturally well disposed towards him; and in the antiquity and duration of his rule the memories and motives that make for change are lost, for one change always leaves the toothing for another. This is the first place where Machiavelli uses an architectural analogy for the concept of organization, which will become an important unifying theme in his political analysis. The term "toothing" has to do with building brick walls. 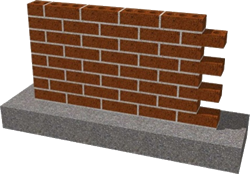 When building structure, a mason, to facilitate future expansion, may build a wall so as to leave every other brick exposed at the end of a wall or at a corner. The alternating bricks will look like a row of teeth. Lands of the Duke of Ferrara. 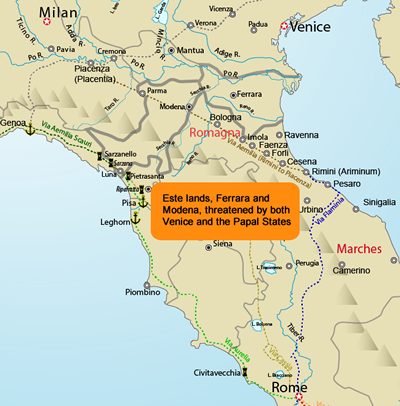 Attribution: Derived from Italy 1494 v2.png Wikimedia Commons. In 1482, an alliance of Venice and Pope Sixtus IV attacked Ercole I d'Este, duke of Ferrara. With the help of his own allies, Ercole outlasted the papal forces and the conflict ended in 1484 with the Peace of Bagnolo. After accepting French help in the League of Cambri war (against Venice), Pope Julius II formed the Holy League to drive the French from Italy. Because Alfonzo remained a French ally, Pope Julius II excommunicated him and officially deprived him of Modena (in 1510) and Reggio (in 1512). However, even though the two Medici Popes (Leo X, Pope from 1513 to 1521 and Clement VII, Pope from 1523 to 1534) remained enemies of the Este, Alfonso regained Reggio in 1523 and Modena in 1527. Outliving Clement by 7 years, Alfonso was able to pass his state to his son Ercole II. For more about the Este family, see the entry in the People section. “But, further, since the desires of men are insatiable, Nature prompting them to desire all things and Fortune permitting them to enjoy but few, there results a constant discontent in their minds, and a loathing of what they possess, prompting them to find fault with the present, praise the past, and long for the future, even though they be not moved thereto by any reasonable cause.” - Discourses Preface to Book II. Discourses on Livy (Oxford World's Classics) . I found this Oxford World Classics series translation of the Discourses to be the most readable. It also provides a useful introduction, and includes generous end-notes that explain how passages relate to Livy and to Machiavelli’s thought.